Western blot analysis of extracts from HuH-6 cells, mouse liver and rat liver using ChREBP Antibody. 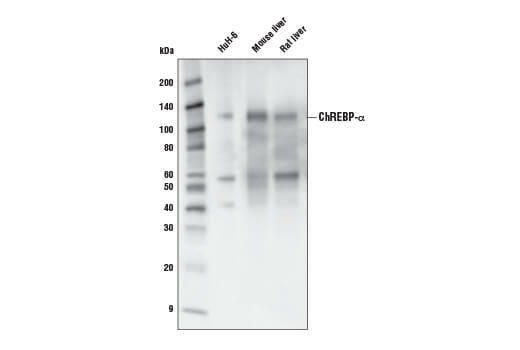 ChREBP Antibody recognizes endogenous levels of total ChREBP protein. Based on amino acid sequence comparisons, the antibody is predicted to detect all known isoforms of ChREBP. Polyclonal antibodies are produced by immunizing animals with a synthetic peptide corresponding to residues surrounding Leu308 of human ChREBP isoform α protein. The sequence surrounding this region is 100% conserved in all known isoforms of ChREBP. Antibodies are purified by protein A and peptide affinity chromatography. Carbohydrate-responsive element-binding protein (ChREBP) is a glucose-responsive transcription factor that regulates glycolytic and lipogenic gene expression (1). High levels of glucose induce the transcriptional activity of ChREBP. ChREBP is most abundant in tissues of de novo lipogenesis and forms a heterotetramer with its binding partner MLX to bind to the promoter regions of its target genes (2). ChREBP regulates fatty acid synthesis, glucose homeostasis and insulin sensitivity in white adipose tissue. In white adipose tissue, ChREBP isoform α (ChREBP-α) activates the expression of the potent ChREBP isoform β (ChREBP-β) in a glucose-dependent manner. ChREBP-β expression levels predict insulin sensitivity in human white adipose tissue (1). In addition, research studies have shown that Akt2 induces the transcriptional activity of ChREBP-β to stimulate de novo lipogenesis in brown adipose tissue for fuel storage (3). Furthermore, ChREBP-β is a potent activator of lipogenesis in the liver (4). Herman, M.A. et al. (2012) Nature 484, 333-8. Abdul-Wahed, A. et al. (2017) Cell Metab 26, 324-341. Sanchez-Gurmaches, J. et al. (2018) Cell Metab 27, 195-209.e6. White, P.J. et al. (2018) Cell Metab 27, 1281-1293.e7.